My group aims to understand how the molecular machinery at DNA replication forks allows eukaryotic cells to preserve their highly complex chromosomes from one generation to the next. One of the most important challenges for proliferating cells is to make a single and precise copy of each chromosome before cell division. In eukaryotes this is a particularly complex task, involving the duplication of vast amounts of DNA, the reproduction of epigenetic chromatin modifications along each chromosome, and other tasks such as the establishment of cohesion between the two sister chromatids that are the products of replication. For these reasons, chromosome replication is one of the most complex and fascinating of all cellular processes in eukaryotes, with mechanisms and regulation that are still understood poorly in all species. A better understanding of chromosome replication is particularly important from the viewpoint of human cancer, since defects in chromosome replication are a very early feature in cancer development, providing a target for the future development of new therapies that might selectively kill cancer cells. Many of the proteins involved in chromosome replication associate with each other to form a multi-protein assembly known as the replisome, which physically connects the essential DNA helicase that unwinds the parental duplex, to the DNA polymerases and other factors. My group is focussed on defining the nature of eukaryotic replisome, understanding its mechanisms of action, and studying its regulation by post-translational modifications. Most of the proteins that we study have a single orthologue from humans to yeast, reflecting the very high degree of conservation of the eukaryotic replisome, and indicating the value of using simple experimental systems. Our work exploits the unique advantages of budding yeast for studies of chromosome replication, combining state of the art biochemical and genetic techniques, but we are also extending our work into mammalian systems where appropriate. The eukaryotic replisome is still much more enigmatic than other large multi-protein assemblies such as the ribosome or proteasome. In large part this is due to the fact that the replisome has a very transient existence at DNA replication forks, being assembled in situ during the initiation of replication and disassembled during termination, so that the replisome does not exist for the majority of the cell cycle. Moreover, the replisome is unstable in cell extracts and cannot easily be isolated in an intact state. On the plus side, most if not all of the components of the eukaryotic replisome have now been identified and are highly conserved, yet replisome structure is poorly defined and many components remain of unknown biochemical function. We aim to identify and understand the unique features of the eukaryotic replisome that are critical for the duplication and stable inheritance of eukaryotic chromosomes, but that are not shared with the much better characterised replisome of E. coli. We found that the eukaryotic replisome is built around a highly stable core, comprising the 11-subunit DNA helicase that is known as Cdc45-MCM-GINS or CMG [1, 2, 3], assembly of which is the key regulated step during the initiation of chromosome replication (Figure 1). Replisome assembly results from the dynamic association of the CMG helicase not just with DNA polymerases, but also with a set of factors that are implicated in chromatin inheritance [1, 4], checkpoint activation, sister-chromatin cohesion and the regulation of fork progression , but for which the mechanisms of action are mostly unclear. At least one of these factors couples CMG to the DNA polymerase alpha-primase complex , which initiates each new Okazaki fragment during synthesis of the lagging strand at replication forks, whereas CMG associates directly with DNA polymerase epsilon that makes the leading strand . (a) How do replisome components contribute to the inheritance of parental chromatin at DNA replication forks? We recently found that the Mcm2 subunit of the Cdc45-MCM-GINS DNA helicase has a conserved ability to bind histones that have been released from chromatin . We aim to define all such activities in the eukaryotic replisome and determine their contribution to the inheritance of parental chromatin. (b) How does the leading strand DNA polymerase contribute to aspects of replisome function that are unique to eukaryotes? Eukaryotes use three different polymerases at DNA replication forks, with DNA polymerase epsilon responsible for making the leading strand. It seems clear that Pol epsilon has other roles at forks in addition to DNA synthesis, and we aim to define the underlying molecular mechanisms. (c) How is the lagging strand machinery incorporated into the eukaryotic replisome? This work involves collaborations with the structural biologists Luca Pellegrini (University of Cambridge) and Alessandro Costa (Cancer Research UK London Research Institute), and our ultimate aim will be to explore the potential for developing small-molecule inhibitors of lagging-strand components, since these might be of interest as novel anti-cancer agents. Figure 1 Assembly of the eukaryotic replisome around the 11-subunit DNA helicase that is known as Cdc45-MCM-GINS. One of the most distinctive features of the eukaryotic replisome, by comparison with its prokaryotic counterparts, is the abundance of regulation by post-translational modifications. The key step during initiation of chromosome replication in eukaryotes is the assembly and activation of the highly stable Cdc45-MCM-GINS helicase complex (Figure 1), and the work of many labs over the last 15 years has shown that this process is driven by extensive phosphorylation of the helicase and its assembly factors, both by Cyclin Dependent Kinase and also by the Cdc7 kinase . The main features of this regulation appear to be conserved from yeast to humans. This is a completely new and important area of research within the field, and our recent unpublished data indicate that disassembly of Cdc45-MCM-GINS will be regulated just as carefully as the assembly reaction during the initiation of chromosome replication. 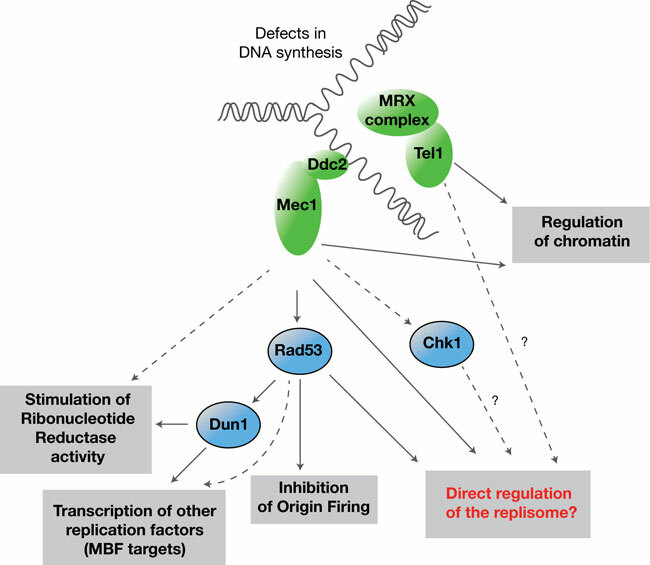 We have found that a specific subunit of Cdc45-MCM-GINS is modified by ubiquitylation during a late step in chromosome replication (Figure 2), and this is coupled to a regulated disassembly reaction. We aim to define the underlying molecular mechanisms , establish whether this has been conserved in other species, and investigate the exquisite regulation of the disassembly reaction, which ensures that it only happens when two forks meet during the termination of DNA replication. Figure 2 Regulated disassembly of the Cdc45-MCM-GINS helicase is likely to be the key regulated step at the end of chromosome replication. In response to defects in DNA synthesis at eukaryotic replication forks, cells activate a conserved signalling pathway known as the S-phase checkpoint, initiated by orthologues of the kinase that in humans is known as ATR . This pathway is highly complex (Figure 3) and represents an important target for the development of novel anti-tumour drugs, which selectively kill cancer cells that retain inherent defects in chromosome replication. Importantly, the molecular targets of the checkpoint kinases within the replisome are still understood poorly. We have found that the Cdc45-MCM-GINS helicase is a direct target of checkpoint kinases , and we will aim to analyse systematically the nature and consequences of this regulation. Figure 3 The S-phase checkpoint pathway (the names of the proteins refer to budding yeast). Gambus, A., Jones, R.C., Sanchez-Diaz, A., Kanemaki, M., van Deursen, F., Edmondson, R.D., and Labib, K. (2006) GINS maintains association of Cdc45 with MCM in replisome progression complexes at eukaryotic DNA replication forks. Nat. Cell Biol., 8, 358-366. Gambus, A., van Deursen, F., Polychronopoulos D, Foltman M, Jones RC, Edmondson RD, Calzada A, Labib, K. (2009) A key role for Ctf4 in coupling the MCM2-7 helicase to DNA polymerase alpha within the eukaryotic replisome, EMBO J., 28, 2992-3004. Sengupta, S., van Deursen, F., De Piccoli, G. and Labib, K. (2013) Dpb2 integrates the leading strand DNA polymerase into the eukaryotic replisome. Current Biology, 23, 543-552. Foltman, M., Evrin, C., De Piccoli, G., Jones, R.C., Edmondson, R.D., Katou, Y., Nakato, R., Shirahige, K. and Labib, K. (2013) Eukaryotic replisome components cooperate to process histones during chromosome replication. Cell Reports, 3, 892-904. Labib, K. (2010) How do Cdc7 and cyclin dependent kinases trigger the initiation of chromosome replication in eukaryotic cells? Genes Dev., 24, 1208-1219. Morohashi, H., Maculins, T., Labib, K. (2009) The amino terminal TPR domain of Dia2 connects SCFDia2 to the Replisome Progression Complex. Curr. Biol., 19, 1943-1949. Labib, K. and De Piccoli, G. (2011) Surviving chromosome replication: the many roles of the S-phase checkpoint pathway. Phil. Trans. Roy. Soc. B, 366, 3554-3561. De Piccoli, G., Katou, Y., Itoh, T., Nakato, R., Shirahige, K., and Labib, K. (2012) Replisome Stability at Defective DNA Replication Forks Is Independent of S Phase Checkpoint Kinases. Mol. Cell, 45, 696-704. De Piccoli, G., Katou, Y., Itoh, T., Nakato, R., Shirahige, K. and Labib, K. (2012). Replisome stability at defective DNA replication forks is independent of S phase checkpoint kinases. Sengupta, S., van Deursen, F., de Piccoli, G. and Labib, K. (2013). Dpb2 integrates the leading-strand DNA polymerase into the eukaryotic replisome. Foltman, M., Evrin, C., De Piccoli, G., Jones, R. C., Edmondson, R. D., Katou, Y., Nakato, R., Shirahige, K. and Labib, K. (2013). Eukaryotic replisome components cooperate to process histones during chromosome replication. van Deursen, F., Sengupta, S., De Piccoli, G., Sanchez-Diaz, A. and Labib, K. (2012). Mcm10 associates with the loaded DNA helicase at replication origins and defines a novel step in its activation. Gambus, A., van Deursen, F., Polychronopoulos, D., Foltman, M., Jones, R. C., Edmondson, R. D., Calzada, A. and Labib, K. (2009). Morohashi, H., Maculins, T. and Labib, K. (2009). The amino-terminal TPR domain of Dia2 tethers SCF(Dia2) to the replisome progression complex. Sanchez-Diaz, A., Marchesi, V., Murray, S., Jones, R., Pereira, G., Edmondson, R., Allen, T. and Labib, K. (2008). Sanchez-Diaz, A., Nkosi, P. J., Murray, S. and Labib, K. (2012). 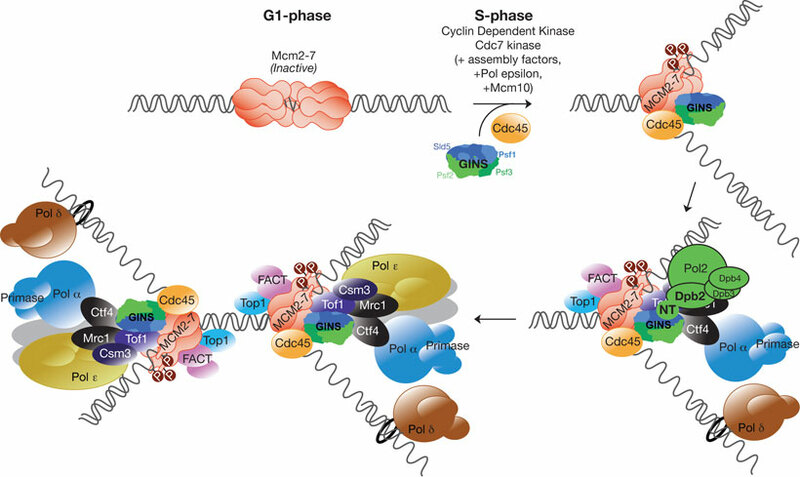 The Mitotic Exit Network and Cdc14 phosphatase initiate cytokinesis by counteracting CDK phosphorylations and blocking polarised growth. Devrekanli, A., Foltman, M., Roncero, C., Sanchez-Diaz, A. and Labib, K. (2012). Inn1 and Cyk3 regulate chitin synthase during cytokinesis in budding yeasts. Kilkenny, M. L., De Piccoli, G., Perera, R. L., Labib, K. and Pellegrini, L. (2012). A conserved motif in the C-terminal tail of DNA polymerase alpha tethers primase to the eukaryotic replisome.